Fiverr: What is a Gig? Can You Make Money with Fiverr? Find Out Here! 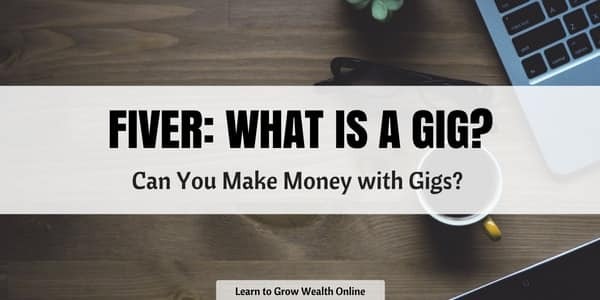 →Fiverr: What is a Gig? Can You Make Money with Fiverr? Find Out Here! Are you familiar with Fiverr and know how it works to help buyers and sellers alike? Do you know what Fiverr gigs are best to avoid? If not, keep reading and I’ll give you a quick breakdown of the micro-gig website called Fiverr.com. I’ll show you what Fiverr is and how you can use it to make money and/or outsource your own work for a mere $5 dollars, it’s incredible. Click Here to Start Making Money with Fiverr! When I first saw the name Fiverr, I was thinking it must be German or something. But no, it’s just five plus er, or 5-er. Maybe 5er.com would have been the better domain name for their website. Anyways, a gig refers to an online micro-gig or micro-job. It’s another great way to make money online from the comfort of your home, or from anywhere in the world. Many travelers recommend Fiverr as a way to stay afloat, financially speaking, when you’re traveling the world. 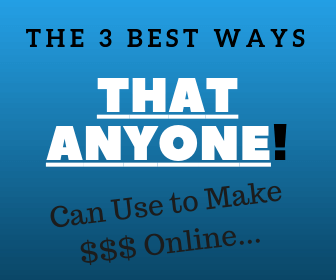 We’re going to run through the basics of how to use this site to make cash. But skills on Fiverr.com can range from funny to goofy, depending on your natural charisma and personality? Basically you can advertise a “Gig” for pretty much anything! 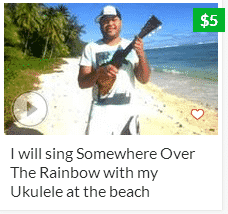 Like the guy above, who will sing Somewhere Over The Rainbow, with his Ukulele from a beach. Fiverr.com is a digital service based website offering freelancers the opportunity to sell their specialty services in the form of gigs, also know as micro-jobs. Every micro-job listed on Fiverr.com starts out at $5, but can go up in price based on the buyers specifications. Update: The platform has recently updated their pricing structure, allowing members to charge more than $5 for services, as well as addons. 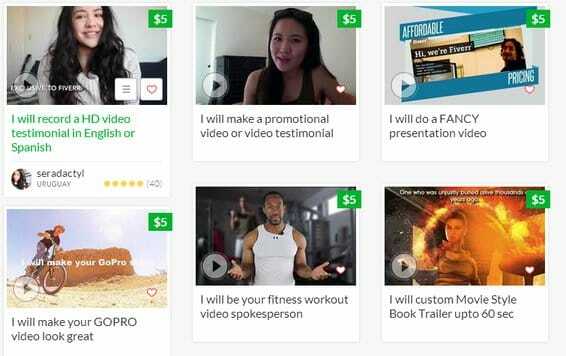 At the same time, Fiverr also allows buyers an affordable and easy way to purchase these micro-gigs at low prices to streamline their own work projects. Fiverr’s freelancers offer a variety of digital services such as; content writing, website reviews, graphic designs, marketing campaigns, programming, etc. “I will make a short video of myself dancing in spandex with a custom birthday message for $5”. Reminds me a bit of Will Ferrell don’t you think? Fiverr offers digital freelancers a way to make consistent online income if they have good seller ratings, feedback, and an on demand service. The provide these freelancers an opportunity to sell their skills by completing quick one time jobs for $5. Depending on the service and the amount of time for a specific gig, they can turn out plenty of gigs in a day to make some decent cash. At the same time, this can take a while for a seller to build up consistent gigs. It takes time to develop your reputation in order to land consistent paying jobs. And one bad review could destroy your entire business! Fiverr sellers can also use the service as a launching pad for their careers. This can be a way to land a permanent job or build up your personal clientele. The basic jobs can start at $5, but with upgrades and other services, you might be selling your services as high as $20-$40. This is also a way to showcase your work skills, artistic abilities, and can be a great way to network your skills in whatever field of expertise you represent. Now for buyers, Fiverr.com can really provide some great services and benefits. For example, say it’s your grandsons birthday and he loves Donald Duck. You can easily find a Fiverr Seller here that does birthday greeting in the Donald Duck voice, and will call your Grandson to wish him a happy birthday. This can be a priceless birthday gift that will bring laughter and joy to a young child for a mere $5 dollars. At the same time, if you need to design a cool business card or a header for your website, and you don’t have technical skills or access to Photoshop, this can be a huge time and money saver for your business. Marketers can find some great service providers on Fiverr, like logo designers, content writers, website builders, keyword researchers, and more. But it can be a hit and miss. A lot of scammers use these gigs to add more social proof to their sales pages! So you can see there are many advantages in using a service like fiverr.com for both buyers and sellers. But are there any cons to this micro gig service? There is always the old adage, “You Get What You Pay For“. As I was researching Fiverr for this article, I found people who felt they didn’t get exactly what they paid for or had some form of complaint. But it really comes down to a little common sense and due diligence. I mean, you shouldn’t expect so much for five dollars. Buyers need to look at the job their are requesting for $5 dollars. If it’s writing 500 words of content, then maybe you’ll get a good article, maybe not. If it’s changing your websites host company to another host company, than this is a pretty easy job for an experienced web master. So you should get exactly what you pay for. I think the most important part for the buyer is to check the sellers rating, read through their profile, read the specifications of their services and see if they have the Top Rated Seller label on their profile. Now if we look into his profile a little bit closer, we can see that he looks to be a pretty trustworthy seller. One Special Warning: Website owners that are considering purchasing Back Links, Social Site Likes or Followers from the Fiverr Online Marketing Section…. I got one thing to say, DON’T DO IT! Most everything that I have read and know about back linking is that back links need to come from natural sources. For example, if you write a featured article on another persons website with a back link to your website, this will be a positive back link that will boost your Google rating. Those are positive back links and Google rewards this. But if you buy fake back links, that can actually do more damage to your website in terms of decreasing your rankings and visibility. Google will actually punish your site for buying fake back links. As well, I have heard that many people who buy social likes or shares end up loosing these followers as soon as they start sharing their content or posting mass social messages. Those can be developed easily enough as well so there’s no need for such frivolous purchases. 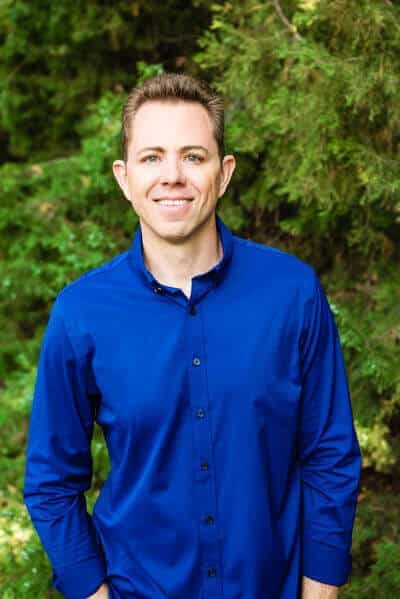 I also have heard several complaints by sellers directed towards buyers that many times they do not read the full advertisement from the Seller, i.e. certain specifications of the gig, etc. Then the Seller is forced to cancel the project due to the Buyer not reading all the details before making their purchase. Fiverr is the fastest growing online gig service and holds the most online gigs in the market, currently about 2,000,000. They offer a rating service for the buyers to review the sellers and the gigs themselves are very low risk to try. $5 dollars shouldn’t break the bank. 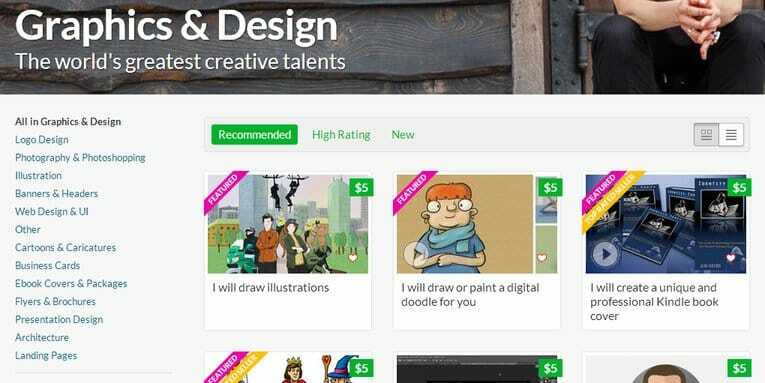 Fiverr.com provides sellers an opportunity to earn quick money for online micro-gigs with potential for consistent work depending on their service and performance. They also provides a great marketplace for buyers to get gigs at a very economical price. If you have any experience as a buyer or seller on Fiverr.com, leave a comment below to let others know what you think of this unique freelance platform. Selling on Fiverr is great and if you put enough time into it, it can turn into a profitable business. 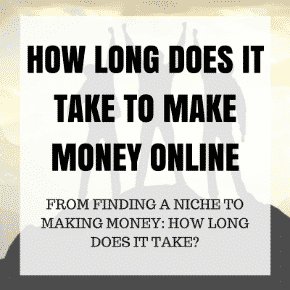 Learn How To Make Full Time Income Online! Thanks for taking the time or read this article on Fiverr Gigs, leave a comment below.